“Now I’m the fun grandma!” laughs Ruth. 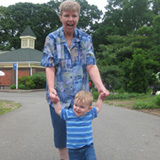 “That’s what I want to be – the one who can chase after my grandson and do fun things with him.” But not so long ago, Ruth struggled to even walk. Ruth had a pronounced limp due to the pain in her hip and knee. She commuted daily from her home in Connecticut into Manhattan for work, and remembers clinging onto the handrails in Grand Central Station to pull herself up the stairs. That’s when Ruth’s rheumatologist recommended a hip and knee replacement surgeon. “When I met him he was very knowledgeable,” Ruth remembers. They scheduled a hip replacement for January 2008 and a knee replacement for exactly 6 weeks later, in February. She was 56. “My recovery was amazing. The other patients at rehab told me that I was their inspiration.” Ruth says she and her grandson actually learned to walk together. “He was just starting to learn and I was just re-learning how to walk properly – heel, toe, heel, toe. I hadn’t been able to do that in four years.” After about eight weeks, Ruth was walking normally, again. People who haven’t seen her in a while are amazed when they see her walking without limping. “It’s been night and day,” she says.